Created by Robert Piéchaud, FinaleScript is a powerful automation plug-in built specifically for Finale. The plug-in provides an interface for writing scripts with a very accessible syntax and grammar that will be familiar to most Finale users. Goal-oriented. The purpose of FinaleScript is to accomplish specific notation goals for your music document(s) once or multiple times. Procedural. FinaleScript performs tasks sequentially (line-by-line) using individual, human-readable commands. Domain-specific. The commands defined in the language only work within the boundaries of the Finale program. For example, instead of manually opening a document, changing the music spacing, transposing a staff, adjusting the page layout, and then saving the document, you might write a script that performs all of these tasks in order with the push of a button. With a little effort, you can automate just about any task in Finale. Noteman says: When you install a new version of Finale on your computer, FinaleScript scripts and options are not copied from the previous version. To migrate these files, see To migrate settings and support files from one version of Finale to another. Many FinaleScript commands refer to global options set in the plug-in. Before running a script, make sure that the FinaleScript options are set correctly according to how you want the script to behave. Choose Plug-ins > FinaleScript > Options. The FinaleScript Options dialog box appears. If you are already in the FinaleScript Palette, click the Options button. Select or deselect the available options, depending on how you want the script to behave. Choose Plug-ins > FinaleScript > FinaleScript Palette. The FinaleScript Palette appears. Select the script that you want to run. If you want to run a script without viewing or editing it first, click the Play button, or right-click the script and choose Run. If you want to view or edit the script before running it, click the View Current Script button (or double-click the script). The FinaleScript Editor dialog box appears. Make any necessary edits and click Run Script. The script is executed, with any corresponding messages for each command appearing in the FinaleScript Palette. If you want to interrupt a script before it is completed, click the Stop button. Every time you run a script, FinaleScript creates a report that logs information regarding the success or failure of commands, as well as the folders and subfolders that were processed. In the FinaleScript Palette, click the Report button. The FinaleScript - Report dialog box appears. If you want to use the report's information elsewhere, click Copy to the Clipboard. Switch to your text editor and choose Edit > Paste (or press CTRL+V). Before creating a new script, we strongly recommend that you review the FinaleScript structure section below as well as the FinaleScript command reference. In addition to creating a new script, you can duplicate an existing script. To do so, select the script in the FinaleScript Palette and click the Duplicate Current Script button (or right-click the script and choose Duplicate). If you want the new script to be placed in a particular folder, select that folder. Otherwise, it will be placed in the root FinaleScript folder. Click the New Script button (or right-click in the script list window and choose Insert a new script). A new script called "Untitled Script" appears in the folder you selected, or, if you did not select a folder, at the top of the list in the FinaleScript Palette. Noteman says: Before editing a script, we strongly recommend that you review the FinaleScript structure section below as well as the FinaleScript command reference. In addition to editing an existing script, you can duplicate it entirely. To do so, select the script in the FinaleScript Palette and click the Duplicate Current Script button (or right-click the script and choose Duplicate). Select the script that you want to edit and click the View Current Script button (or double-click the script). The FinaleScript Editor dialog box appears. You can also right-click the script and choose Edit. Make any necessary edits in the editing window. Type commands in the editing window. As you type, FinaleScript colors the text according to an automated coloring scheme to display the function of script text. FinaleScript uses an automated coloring scheme to display the function of script text. As you type, FinaleScript updates the coloring of each word automatically. For a discussion of each type of keyword, see Using FinaleScript - FinaleScript structure. 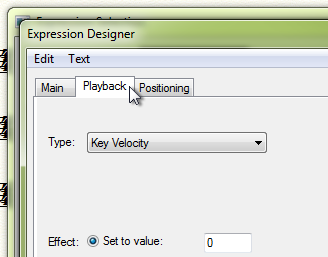 In the Script Name text box, edit the name of your script. Select Show in Menu if you want your script to appear in the Plug-ins > FinaleScript submenu. Next to Use Shortcut, click Select if you want to assign a keyboard shortcut to your script. As you edit your script, it's a good idea to periodically click the Save button so that you don't lose any work. If you are already viewing your script in the FinaleScript Editor dialog box, next to Use Shortcut, click Select. If the FinaleScript Palette is displayed, right-click your script and choose Edit Keyboard Shortcut. Press a simultaneous combination of keys on your computer keyboard. The combination appears in the dialog box. Click Find one! to have FinaleScript suggest an available keyboard shortcut. Click None to remove the existing keyboard shortcut. Click Save and Close. Your script now appears in the Plug-ins > FinaleScript submenu. Each script is its own XML file. If you want to manage your script(s) outside of Finale, navigate to the FinaleScript directory within your Finale User folder (see Finale Installation Details). Noteman says: Any script or folder that you delete is moved to your computer's Recycle Bin and can be restored (prior to emptying the Recycle Bin). To rename a script, right-click the script and choose Rename. In the FinaleScript - Rename dialog box, type the new name for the script and click OK.
To make an exact copy of a script, click the Duplicate Current Script button (or right-click the script and choose Duplicate). To move a script into a different folder, drag it to that folder. To delete a script, click the Delete Script button (or right-click the script and choose Delete) and click Yes in the confirmation warning. To create a folder, click the Create a New Folder button (or right-click in the script list window and choose Insert a new folder). To rename a folder, right-click the folder and choose Rename. In the FinaleScript - Rename dialog box, type the new name for the folder and click OK.
To move a folder into another folder, drag it to that folder. To delete a folder, click the Delete Script button and click Yes in the confirmation warning. Each script is its own XML file. Like any other document file, you can share this in any number of ways (email, FTP, etc). Write and save your script in the FinaleScript Palette, and close Finale. In Explorer, navigate to the FinaleScript directory within your Finale User folder (see Finale Installation Details). The FinaleScript directory mirrors the folder structure of scripts in the FinaleScript Palette. Locate your script. The filename of your script is the same as the Script Name in the FinaleScript Editor dialog box, except spaces are omitted and all characters appear in lowercase. Optionally, you can make a copy of the script and paste it in an easy-to-find location, such as your Documents folder or desktop. Use whatever means you prefer to send this file to the recipient(s). FinaleScript consists of a predefined set of commands, each of which performs a specific task. Each command is made up of one or more keywords and may support one or more parameters. Noteman says: The attribute grand actually creates two staves, a treble clef staff on top and a bass clef staff on bottom. It then creates a group named Calliope and adds a piano brace to the group. This is exactly the behavior you would expect when creating a grand staff instrument in the Score Manager, such as a piano. In this example, we've added two parameters: the attribute grand to create a grand staff, and the string "Calliope" to give it the staff name Calliope. This example demonstrates one of FinaleScript's readability features, namely, that keywords constituting a single command can be arranged in any order and can even be separated by parameters. If this were not the case, the line would have to read create staff grand "Calliope", which is certainly less readable. By allowing this flexible syntax, the line makes much more sense semantically. create 2 bass staves "Trombone" "Tbn." Here, we've created two independent staves, given them each bass clefs, and assigned them each a full staff name of Trombone and an abbreviated staff name of Tbn. Another of FinaleScript's readability features is included: the synonym staves has been substituted for staff (we'll get into synonyms a bit later). If this were not the case, the line would have to read create staff 2 bass "Trombone" "Tbn. ", which again isn't as readable as the line above. Noteman says: In addition to these four types of parameters, there are several others that have to do with Finale's "under-the-hood" architecture. However, the types listed will suffice in almost every situation. Numerals. These variables (num1, num2) are numeric values that usually specify particular elements in a document, such as measures, layers, or pages. If a numeral is described by a measurement unit, by default it refers to the currently selected measurement unit; however, it can be followed by a measurement unit attribute (such as in, cm, picas, etc.). Numerals do not require any delimiting characters. the name of something in the Finale user interface, such as a dialog box. Strings are delimited by double quotes. Fonts. These variables (font1, font2) are alphanumeric values that specify the name of a font, such as when using Text Search and Replace. Fonts are delimited by square brackets. Attributes. Like keywords that constitute commands, these are predefined terms that either modify a command or alter the task that a command performs. Because attributes are predefined, they do not require any delimiting characters. For some commands, parameters are optional; for other commands, they are required. 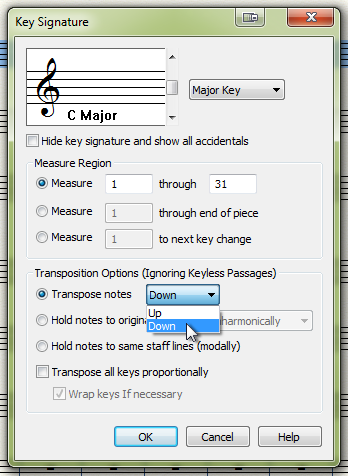 In the previous example, the bass parameter is optional: while the create staff command is complete without it, the bass attribute modifies the command to be more specific: create staves with bass clefs. In the example below, the parameters 1 and 2 are required: without them, the command doesn't make sense. It is important to note that many commands exhibit different behavior based on what part of the document is selected when the command is executed; either the command will affect the selected region, or, if there is no selection, the command affects the entire document. You can think of this as another parameter, since it modifies the behavior of the command. Command synonyms. An entire command can often be replaced by a synonym. In the above examples, you can use the two-word command delete music as a synonym for the one-word command clear. Individual keyword synonyms. The words that make up a command can often be replaced by a synonym. In the above examples, the keyword reset is a synonym for clear, and the keyword remove is a synonym for delete. In the second command, bottom is a valid synonym for end, but its meaning isn't immediately obvious. In the third command, the keyword to has been removed, which is a valid omission (since to has no actual function in the context of this command) but again makes the selection constraints more obscure. In the fourth command, 0 is understood by FinaleScript to mean "through the end of the document", but it's unlikely that a casual observer would be aware of this syntax. For these reasons, the first command is the best choice. It is not the most concise option possible, but it is the most intelligible with the least amount of opportunity for misinterpretation. For a list of equivalent values for spacing units, see Equivalents - Measurement units. If this seems overwhelming, fear not! The FinaleScript command reference topic lists all the relevant synonyms that you can use for each command. Adding comments to your script is yet another way of removing ambiguity for someone viewing your script. Use comments to provide "signposts" in your script: point out crucial information, indicate optional instructions, or simply provide clarity as to what action(s) a line or section performs. Tip: You can quickly switch a single line between commented and uncommented by right-clicking the line and choosing Comment/uncomment. Besides providing direct commands for the main tools, many functions found in menus, and specific document options and settings, FinaleScript makes it possible to access nearly any element of the Finale user interface. You can choose any item found in a Finale menu using the menu item command. You can either specify the full menu path, or, if its name is sufficiently unique, the menu item only. If a menu item can be toggled, use check or uncheck. 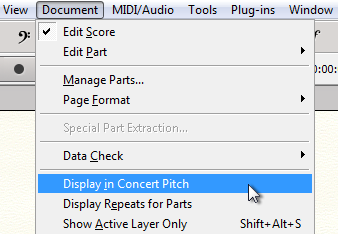 check menu item "display in concert pitch"
uncheck menu item "display in concert pitch"
For the sake of brevity, you can use either * or % to shorten long menu items. Make sure that if you do so, the script is still easily understandable. Good: plug-in "band in a box*" //instead of "band in a box auto-harmonizing"
Ugly: menu item "edit*" //edit filter? edit staff attributes? edit learned chords? Tip: You can also use shortcut characters when referring to other interface elements (see below). Noteman says: Strictly speaking, FinaleScript does not recognize near as a valid keyword and so its usage is not necessary: only the string containing the label is required. However, for readability, using near is recommended. You will encounter situations where a dialog box either has an item with a label (such as a text box) or has more than one item with the same label (such as a Set Font button). In these cases, use near followed by a string. menu item "edit staff attributes"
When there are multiple text boxes aligned in a grid, the labels become ambiguous. To navigate between the different fields, use tab. 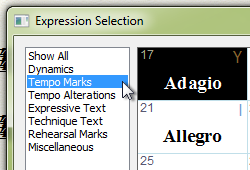 menu item "rebeam to time signature"
type 2 near "beat groups"
FinaleScript recognizes buttons based on their label. Buttons labeled ok, cancel, set font, save, delete, select do not require double quotes (unless using a neighborhood specifier). As with menu items that can be toggled (reversed), use check or uncheck. Additionally you can switch the current state of the checkbox using click checkbox. A radio button is one control in a set of options that are mutually exclusive. select radio button "top staff only"
The select drop-downpopup menu command selects a particular item from a drop-down menu. Though not always needed, it is best practice to include a neighborhood specifier for clarity. Good: select drop-downpopup menu "down" near "transpose notes"
Less good: select drop-downpopup "down"
Lists are similar to drop-down menus, except that their options are always visible rather than being concealed. Some dialog boxes include multiple tabs to separate settings into logical categories. You can switch between them with select tab. type "play second time only" near "description"
select drop-down menu "key velocity" near "type"
type 0 near "set to value"
check "play only on pass"
type 1 near "play only on pass"
Combine the attribute expect with any user interface command to instruct FinaleScript to wait until the specified item is available. Noteman says: Blocking dialog boxes are not bypassed. Tip: To enter multiple characters, see type below. If you need to enter characters into a text box within a dialog box, use type. menu item "edit measure number regions"
type 1 near "includes measure"
uncheck "show measure numbers at start*"
type 5 near "show on every"
type 5 near "measures beginning with measure"
check "enclosure" near "show on every"
The raw attribute can be combined with modifier keys to apply the key(s) to each character in the type string. Noteman says: In the past, raw was also used to select list items for inaccessible Mac lists such as font selection (e.g., type raw "petrucci"). type raw "release the penguins"
type "penguin release" near "description"
… or a formatted text field in an Edit Text dialog box (such as group or staff names and custom line text), the Text tool's Edit Text dialog box, and the Lyrics window. type raw "Clarinet in B"
It is important to note that raw only works if the text field already has focus. This means, for example, that you cannot combine raw and the near attribute in the same line. Use cursor to position the mouse pointer at a particular horizontal and vertical distance (in pixels) from the top-left corner of the screen. The click command supports both the double attribute and modifier key attributes. Use select window (or select dialog box) to switch to an open dialog box. The dialog box must be modeless, meaning that it does not require the user to dismiss it before clicking elsewhere in Finale (most dialog boxes are not modeless). type "Fredric Marc Bunbury" near "arranger"
select window "edit page margins"
Perhaps the most powerful aspect of FinaleScript is its ability to apply commands to multiple documents automatically. This task is called batch processing. You can either process all documents that are currently open in Finale, or you can process documents within a particular folder on your computer. Because FinaleScript executes commands sequentially, you must state your intention to process more than one document early in your script, before any subsequent commands. This is particularly useful if you are copying settings from one document to others using the import options command. Noteman says: The source and destination folders only apply to the FinaleScript save command (with possible parameters). These settings do not apply to exporting graphics, audio files, MusicXML, etc. batch process source folder "c:\music\scores"
batch process destination folder "c:\music\scores\converted"
… or you can select the folders in the FinaleScript Options dialog box before running a script. If you need to specify a folder location within a script, you can easily insert the location by right-clicking in the FinaleScript Editor and choosing Insert path. A dialog box appears asking you to select the folder. Choose the folder and click OK. The folder path is inserted into your script, contained within double quotes. Tip: If you are providing exact paths within a script on Mac, you can use POSIX, HFS, and Windows path styles. Let's dissect a few scripts that are installed with Finale. This script opens with a comment. The first command, unit, followed by the attribute evpus, sets the global measurement unit to EVPUsEVPUs, or ENIGMA Virtual Page Units, are Finale's flexible units of measurement used to calculate the size and spacing of your music, defined as 288 EVPUs per inch or 24 EVPUs per space. You can display the measurements in more common units such as inches, centimeters, points or spaces.. The next line modifies the command thickness with the attribute staffline: all staff lines in the document will have a thickness of 6 EVPUs. Note that the attribute can come either before or after the command. Next, we set the page size using a page format command to a horizontal dimension of 21 cm by a vertical dimension of 29.7 cm; here, the cm keyword overrides the global unit set by the initial unit command. A single-line comment reminds us of this behavior. The beam thickness command, as you might expect, sets the global line thickness for beams to 24 EVPUs. A final use of the comment delimiter (//) actually performs a secondary function of comments, usually referred to as "commenting out" a command. Without the slashes, this would be a valid thickness command that, like the third line, would set the global line thickness for staff lines, this time to a value of .02 inch. However, the author of this script has (at least temporarily) "commented out" this command: FinaleScript will not perform any action and sees only a comment. message "Remember to adjust the page size in Page Setup under the File Menu." For ease of use, the script begins with two processing commands that are currently commented out but can easily be "switched on". The essential command for this script comes next: page format with the tabloid attribute. Three more commented-out commands provide options for resizing various score elements with helpful preset values. reorganize layout unlocks the measures and updates the layout, while respace applies Note Spacing. A message appears to inform the user that an appropriate page size must be selected before printing. //Your mouse pointer should be near the top left corner of the page. //Creating a shortcut can make this script easier. dropdown "Page Range" near "Attach to"
type 2 near "Page Range"
check "Use Right Page Positioning"
dropdown "Right" near "Use Right Page Positioning"
The opening comments remind the user that the second command, double click, occurs wherever the mouse pointer is located, which needs to be on a blank part of the page. The Text tool is selected, a text frame created by double-clicking the page, and a page number is inserted via Text > Inserts > Page Number. The Frame Attributes dialog box is displayed, followed by six commands editing the settings in the dialog box before clicking OK.
menu item "delete staves and reposition"
The length of this script is a good demonstration of the types of complex tasks that can quickly be automated using FinaleScript. After opening comments, there are two commented-out processing commands for convenience. A grand staff with full staff name "Piano" is created at the bottom of the score. The work on layer 1 command that precedes this ensures that the copying of staves in the next section will not overwrite existing layers. The second staff (alto in the SATB example) is copied to the grand staff's treble clef staff and moved into layer 2; an optional commented-out delete lyrics command is provided, which also appears for the subsequent three command sets. Staff 1 (soprano) is copied to the grand staff's treble clef staff (in layer 1). Staff 4 (bass) is copied to the grand staff's bass clef staff and moved into layer 2. Staff 3 (tenor) is copied to the grand staff's bass clef staff (in layer 1). The original four staves are deleted and the grand staff repositioned (the comment indicates that these lines could be commented out if desired). Document > Show Active Layer Only is switched off, as are any alternate notation in the grand staff's individual staves. Closing processing commands (saving and closing the document(s)) are provided for convenience. Since this is a batch processing script, the batch process folder command is active by default. Alternately, the user could choose to process all open docs. 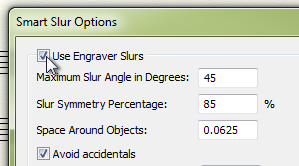 The Graphics tool is selected and Graphics > Export Pages selected. Four file format options are provided. All pages will be exported. File names will follow the "[Document name]#" format. The resolution is set to 1200 dpi. For PostScript output, Include fonts and Allow transparency can be selected. The dialog box is dismissed and the document closed. The commented-out expect to return command is necessary for PDF output. Most of the time, you'll want to create a script that does more than execute a single command. To do so, follow this process. Plan ahead. Before writing your script, make sure you know exactly what goal you want the script to accomplish. Only then can you determine the component commands that are necessary to accurately execute the required tasks. For more complex scripts, you might also want to consider the suggested Order of entry for Finale documents. Use the FinaleScript Palette's command line to try out individual commands on a dummy document. The Palette displays the name of the active document just above the command line so that you know what document is being affected when you execute a single command. Create an empty script. Give your script a descriptive name, and if you want, place it in a categorized folder. If you'll be using this script often, such as to batch automate multiple documents, consider assigning it a keyboard shortcut or displaying it in the FinaleScript menu. If a script already exists that performs some of the functions you will require, you could duplicate that script with a new name and, as they say, go from there. Type the commands and attributes. As you type, FinaleScript colors the text according to an automated coloring scheme to display the function of script text. Use this automatic formatting to your advantage, making sure that what you've typed actually exists in FinaleScript's vocabulary and that you don't have more than one command per line. Be careful to check your work as you go: as little as one mistyped character can drastically alter or even halt the action of your script. Make liberal use of comments. Even though FinaleScript is meant to be easy-to-read, a long or complicated script can quickly become indecipherable. Thoughtful comments delineate structure and can even go a long way toward making a script easier to write in the first place. This is as much for yourself as for anyone else who might utilize your script. Comments are especially useful in pointing out parameters (or even entire sections of your script) that can/should be changed prior to running the script depending on the situation, such as file paths. Test your script on a dummy document. We really can't stress this step enough. DON'T ASSUME THAT YOUR SCRIPT IS FLAWLESS. Create a dummy document with similar notation to the document(s) you're designing this script for, and then run the script on this dummy document. Analyze the results; if satisfactory, you're all set. In many cases, though, you may need to tweak your script, or even completely rethink how to approach the task at hand. If a command isn't working, check for spelling mistakes. Try it out – but have a backup. Before running the script on your document, make a backup copy of the document so that you can replace it if the unthinkable happens. If the script performs its tasks successfully, then you've got a keeper! But even if it doesn't, and for some reason you can't undo the actions, you'll have the original document so you can try again. Best of luck, and happy scripting!